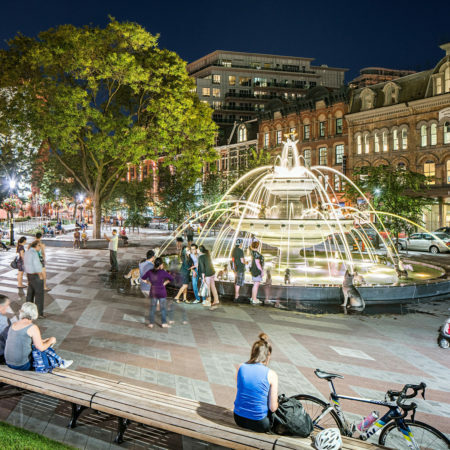 Berczy Park is a small park on the threshold between Toronto’s Old Town and Financial Districts, which had become overwhelmed by community needs that were never anticipated when it was first built almost 40 years ago. 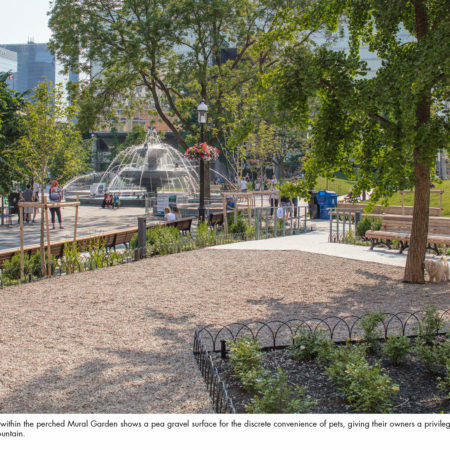 The park needed a redesign to address a rapidly diversifying community with seemingly incompatible demands. 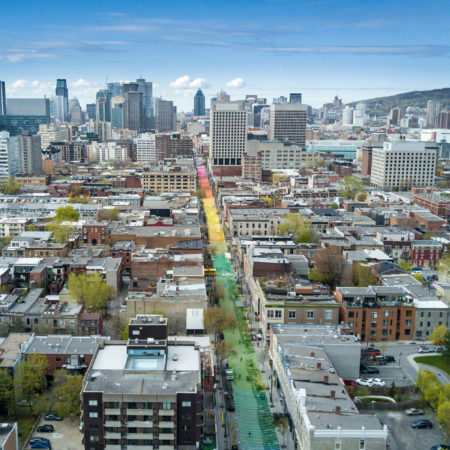 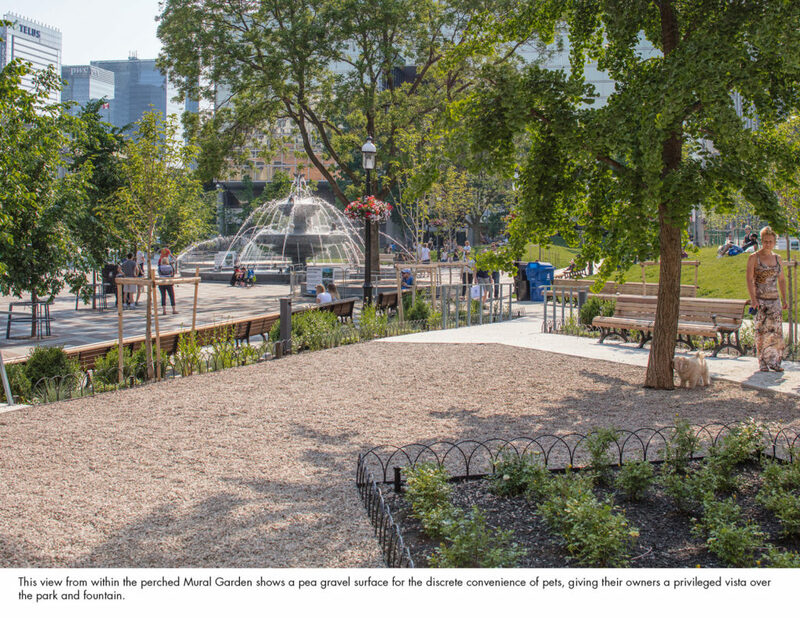 With 400 children and over 1500 daily dog visits now within a two-block radius alone, this little park had to rise up to the demands of its new contextual complexity, generating animated debate amongst stakeholders about who and what the new park should be for. 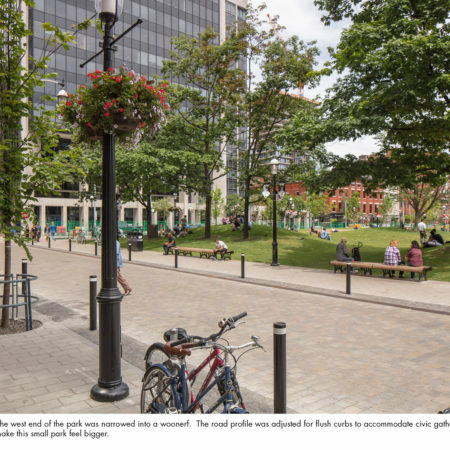 Local business owners wanted to keep their iconic postcard park for tourists and visitors; parents wanted a space where their small children could safely run and play; pet owners wanted the same, but instead for their dogs. 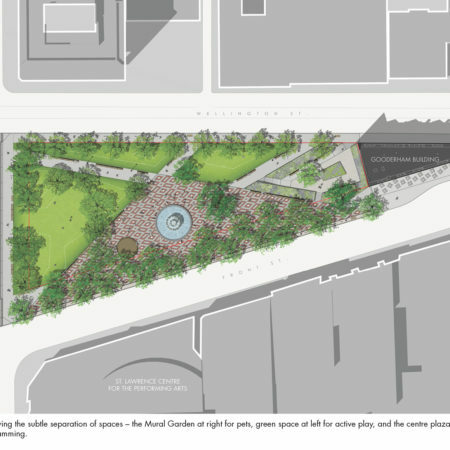 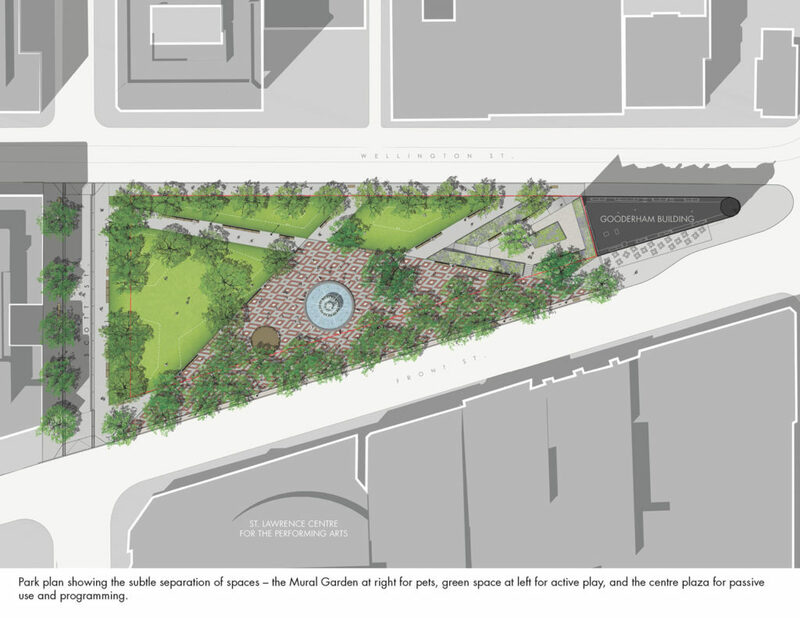 Three separate zones ensued – a green space for play, a garden for dogs, and a plaza for public gathering. 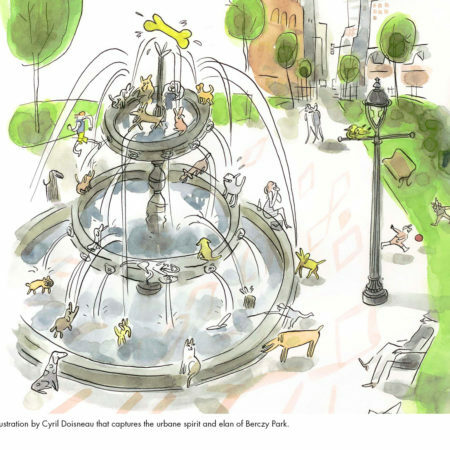 To prevent a small park from becoming three even smaller parks, the dog fountain was invented to transcend contention into consensus and unify the experience for all visitors while reinforcing the specificities of each. 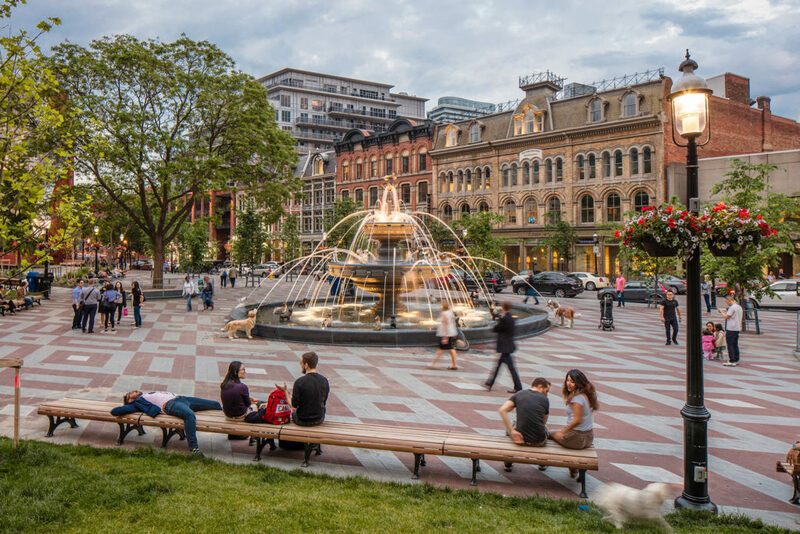 For local businesses, the 19th Century brand of the Old Town is amplified by this whimsical yet timeless object at the heart of the park. 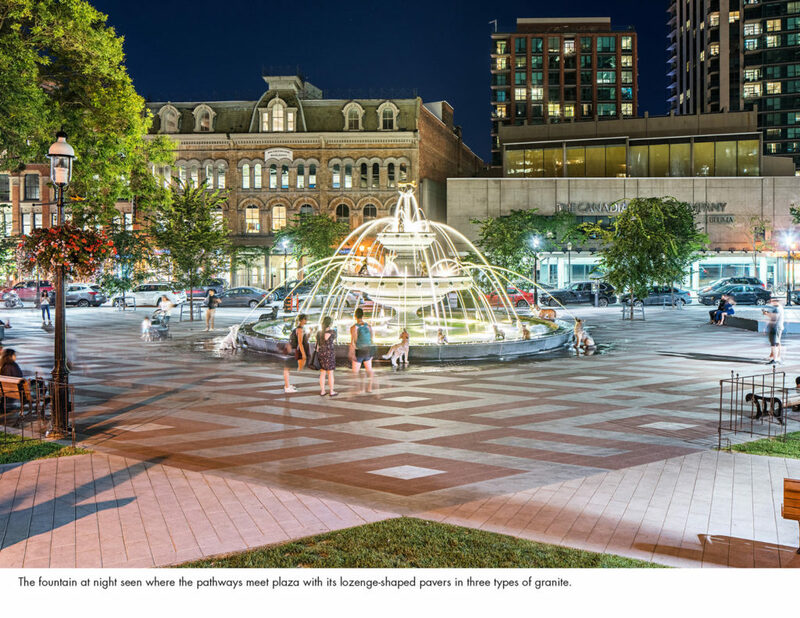 Children have a menagerie of spouting sculptures to play on, close to ample seating where parents can hang out with other parents within reach. 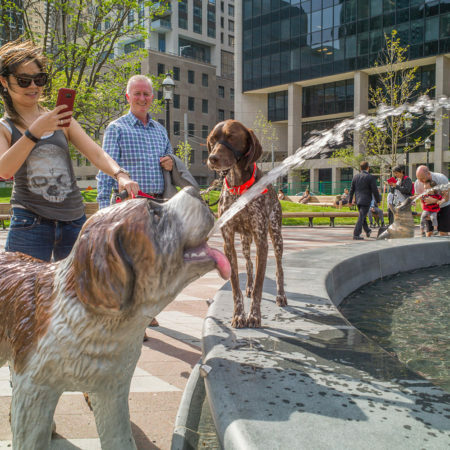 And dog owners bring a constant parade of pups that animate their statuesque counterparts, lured by a continually running supply of fresh water around the granite basin perimeter. 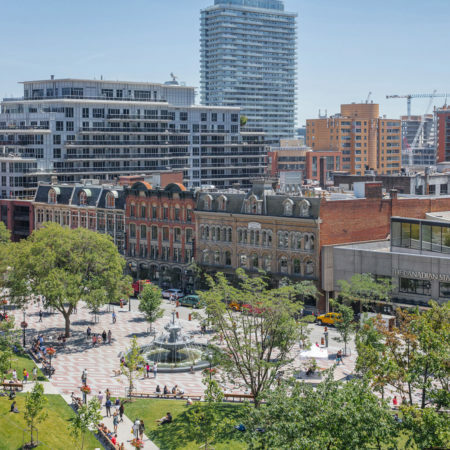 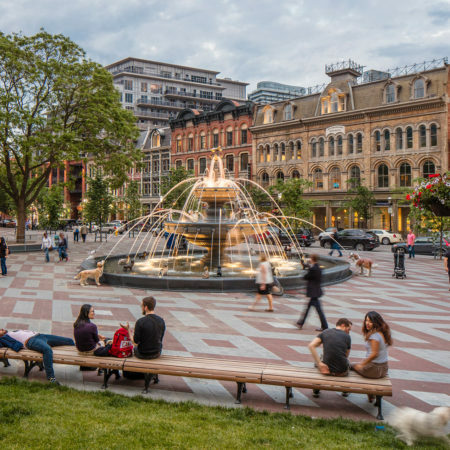 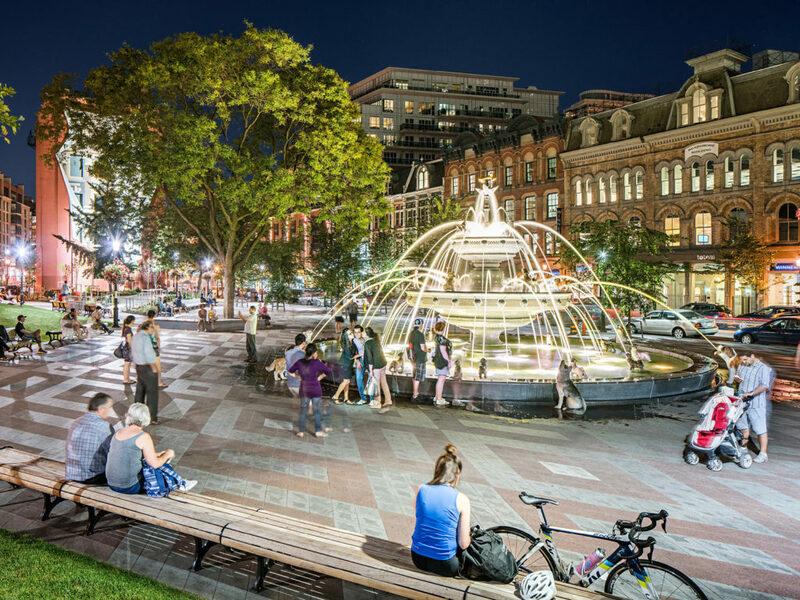 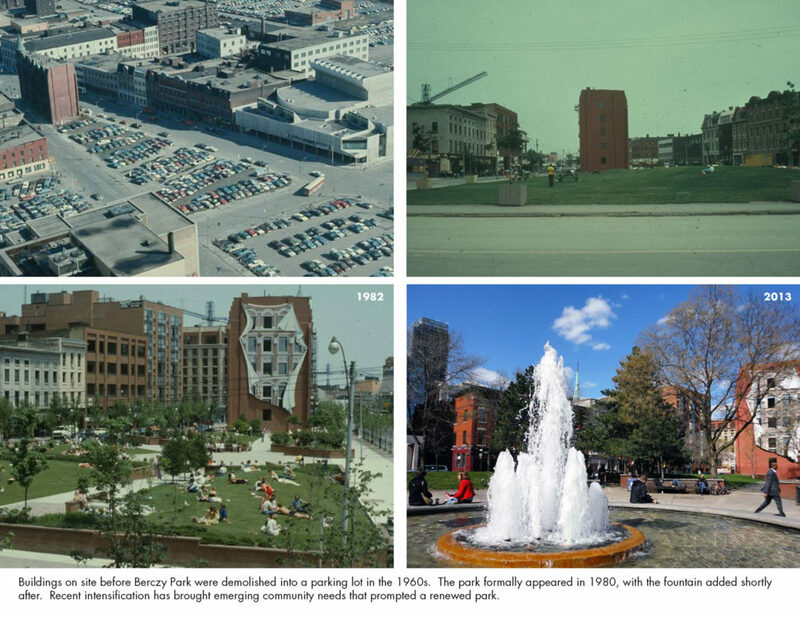 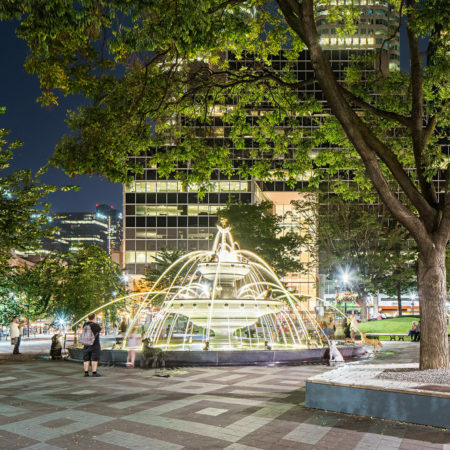 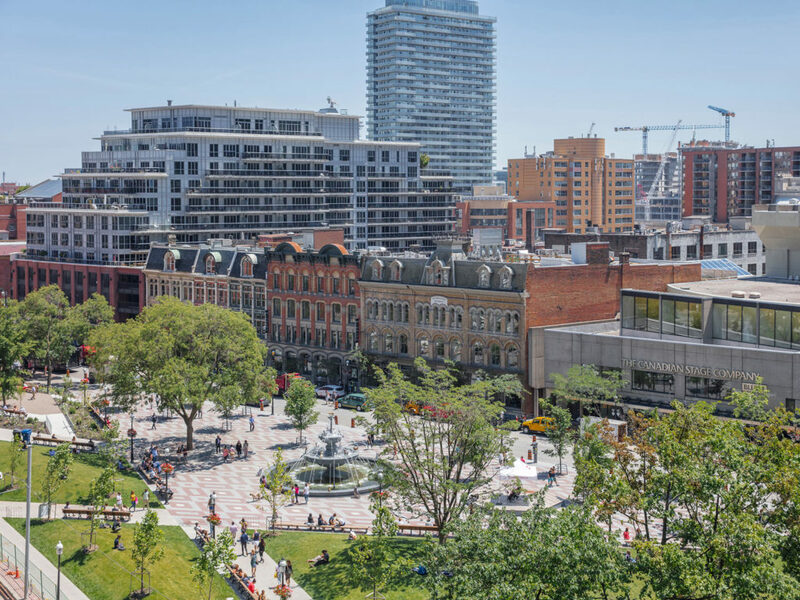 For the average park user who doesn’t necessarily rely on Berczy Park for a specific community need, the fountain becomes an active and aesthetically charged landmark that engages residents and visitors alike to participate in the mise-en-scene of everyday urban community life. 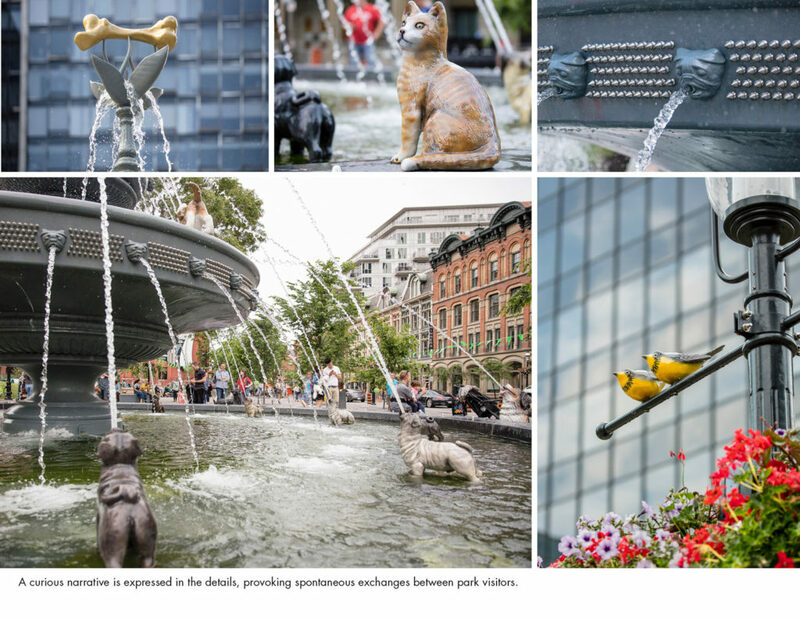 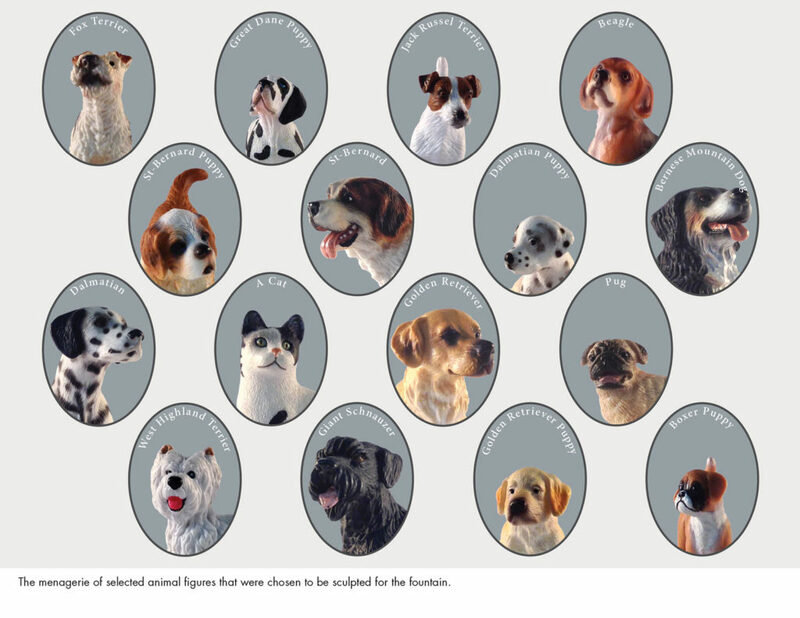 The universal appeal of dogs underlies the intention for a dog fountain in Berczy Park. 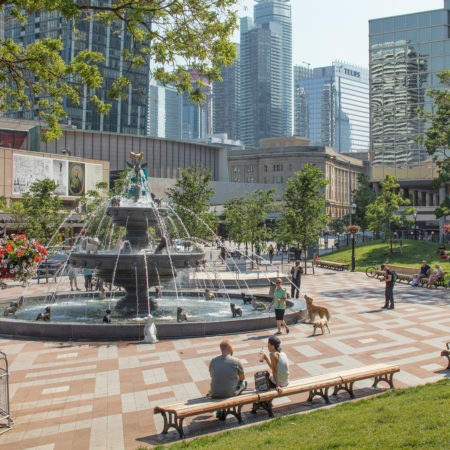 But a dog-spirited genius loci had permeated Berczy Park for a number of years, tangibly manifest not only in the endless streams of dog visits, but also as the birthplace in 2002 of Woofstock, the largest annual festival for dogs in North America whose popularity recently outgrew the neighbourhood. 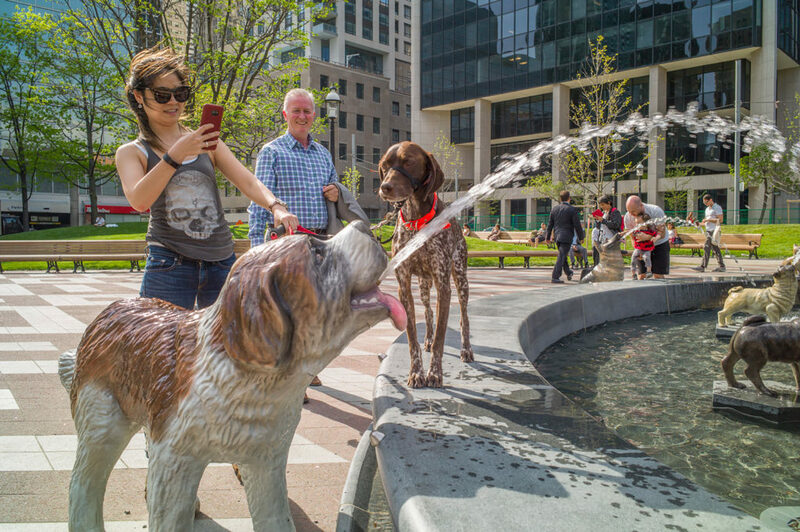 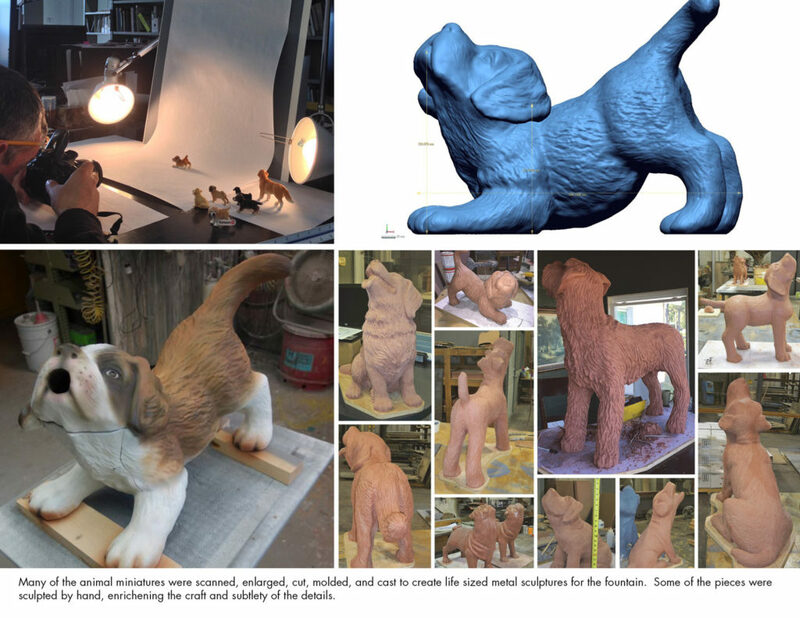 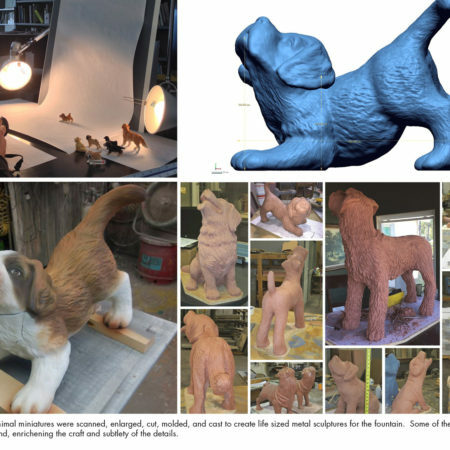 The focal point of the park redesign is a custom cast-iron fountain detailed with 27 life-size dog sculptures and the accoutrements of canine culture. 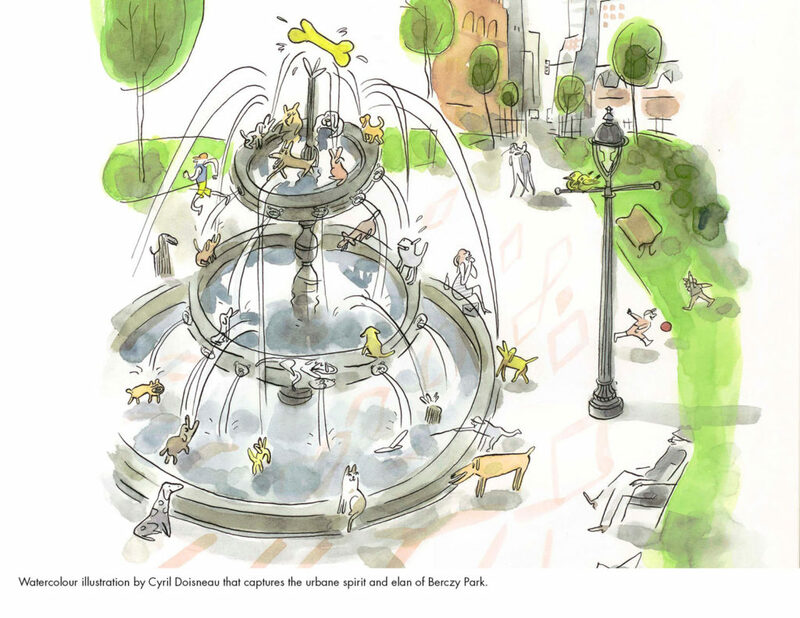 Six large dogs from Bull Terrier to Golden Retriever shoot water into the tiers of the fountain, in chorus with a ring of bobbing pugs in the basin. 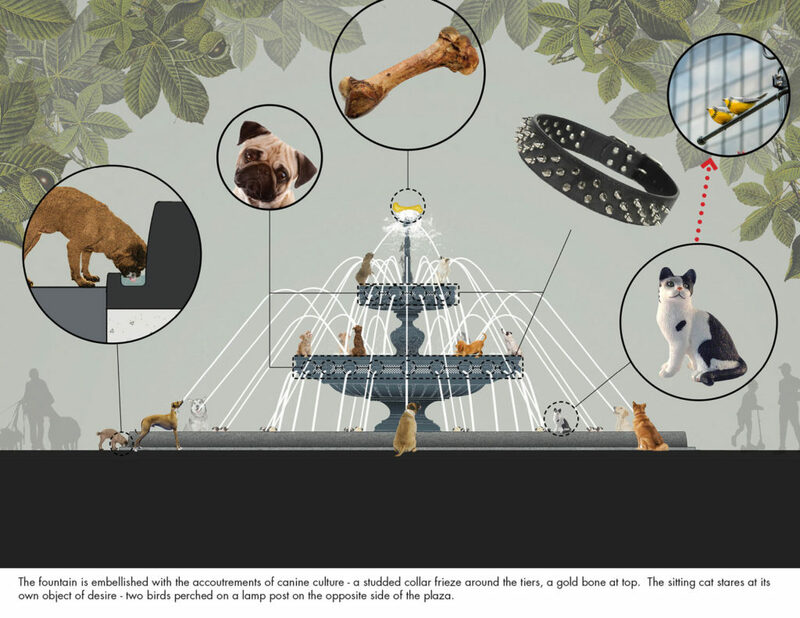 The perched tiers of the fountain host other small to medium-sized dogs, their jets aiming towards the object of their dog desires – a cast golden bone perched at the apex of the fountain. 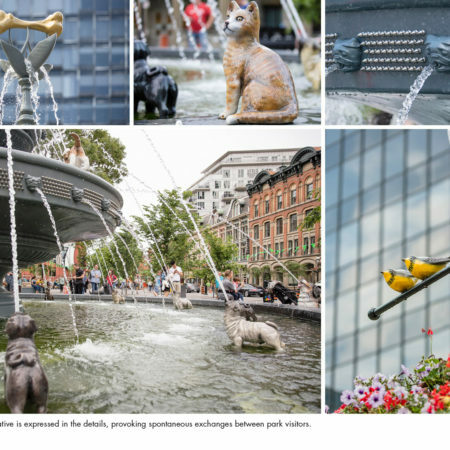 Splashing jets fill the tiers from below, which in turn are drained through a frieze of cast pug faces flanked by a staggered array of oversized silver dog-collar studs. 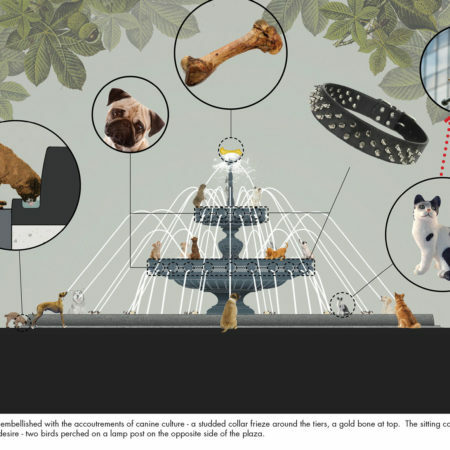 For those who don’t care much for dogs, perched indifferently on the side of the basin is one cat, staring nonchalantly at the object of its own desire – two cast birds perched atop a lamppost on the opposite side of the plaza. 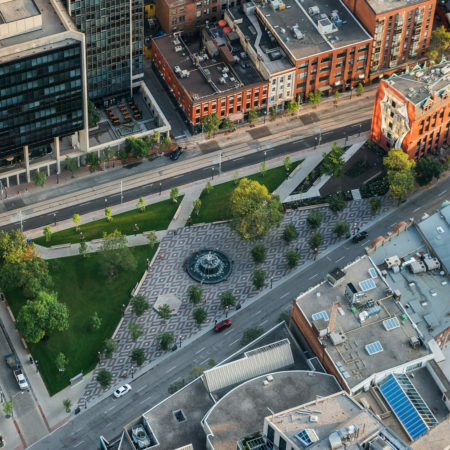 The new park layout mimics the unique triangular shape of the block, stretching perspectives to make this small park feel big. 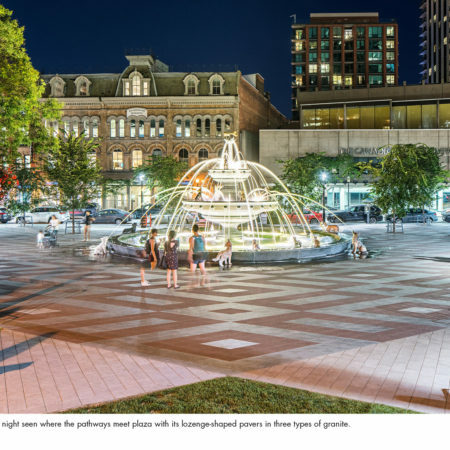 Pathways follow diagonal trajectories to reinforce long desire lines and sight axes, with views to the central fountain and architectural icons beyond. 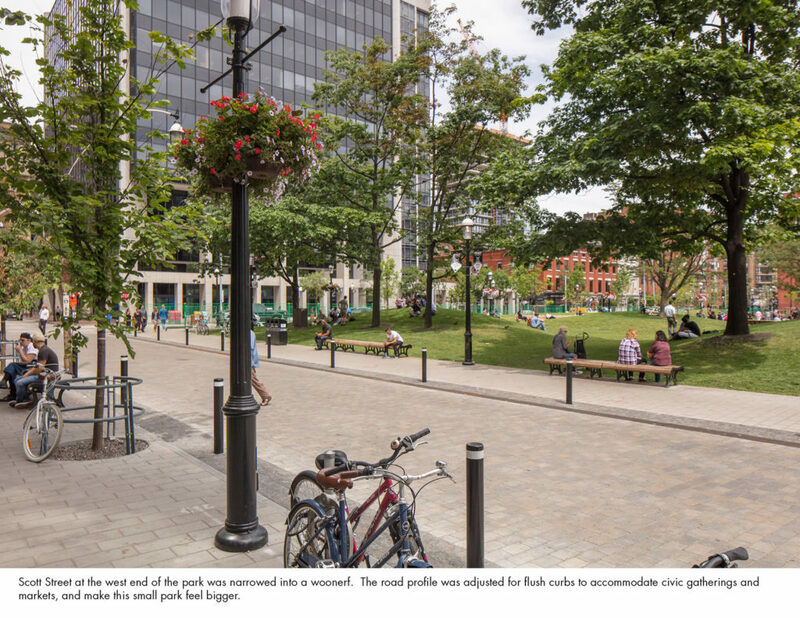 Park edges have been stretched to the curbs, and Scott Street at the west has been narrowed into a woonerf with flush curbs that expand the footprint of the new park. 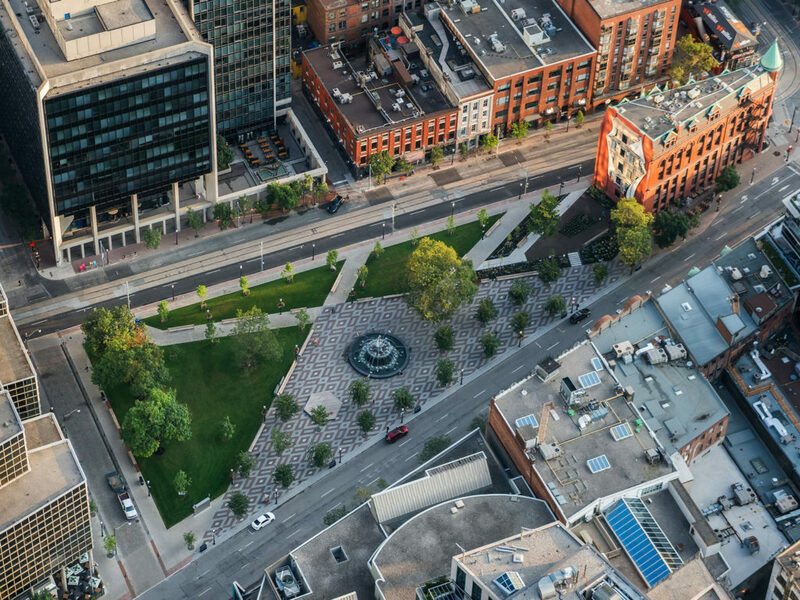 Lawn horizons overlap to conceal traffic on the perimeter streets, reinforcing an illusion of vastness as well as subtle enclosure. 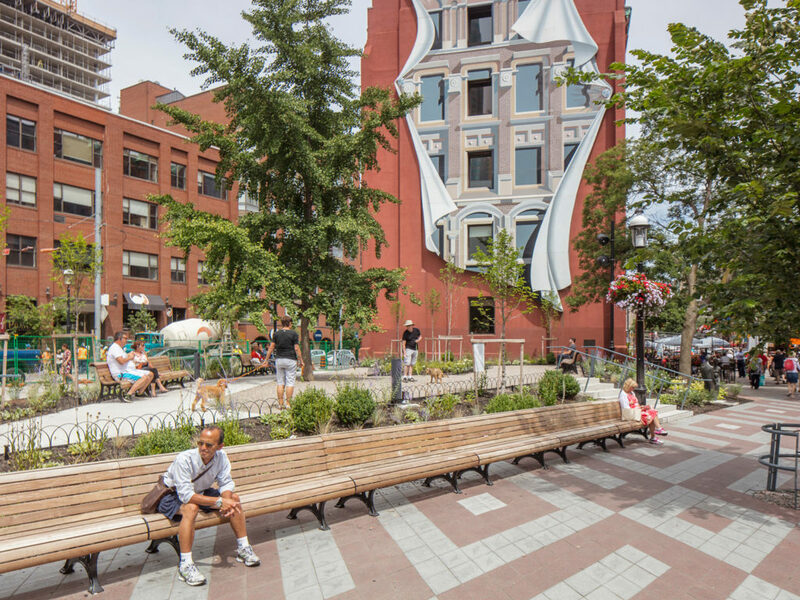 The trompe l’oeil of the pre-existing mural on the back of the Flatiron Building is manifest through the stretched skew of the three-tone granite checker pattern in the plaza as well as the interplay between real and artificial dogs. 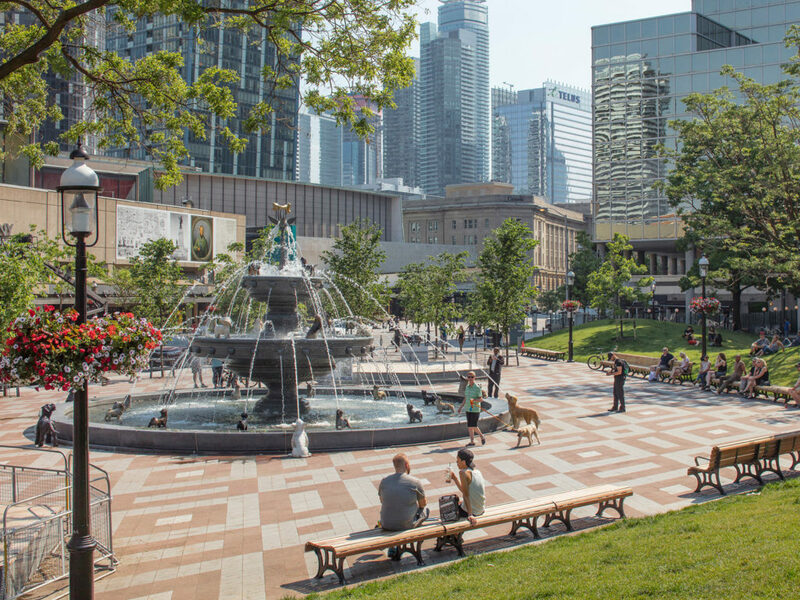 Public seating has been deployed to promote opportunities for impromptu exchange between strangers through stretched benches, platform stages for outdoor performances, as well as movable chairs and tables (to be introduced in 2018). 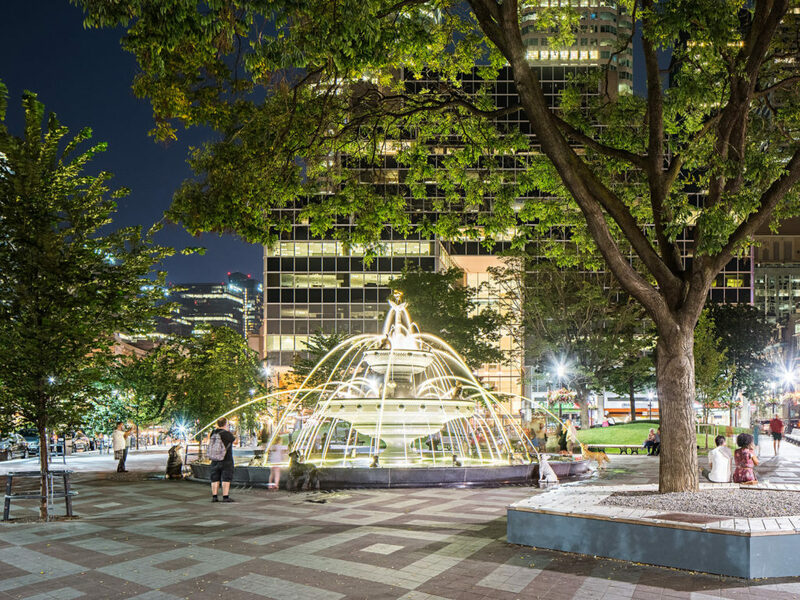 The park has attracted surprisingly large numbers of visitors since it opened in June 2017. 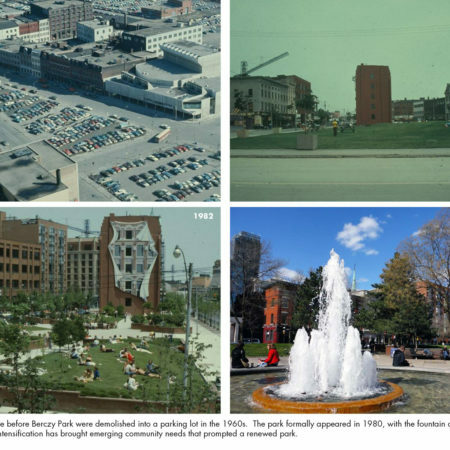 Typically reserved citizens were frequently witnessed expressing themselves through shout-outs like “Thank you!” and “We love it!” during construction, followed by letters of appreciation for the “outstanding design, superb workmanship”, and gratitude for having “a place to come and sit and watch the world go by”. 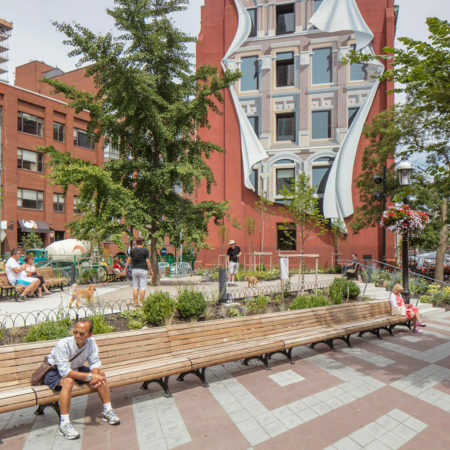 The new park has brought people out of themselves to engage with their surroundings and each other in unexpected ways, as manifested through laughter and smiles, spontaneous outbursts of conversation between strangers (can you spot what that cat is looking at?! 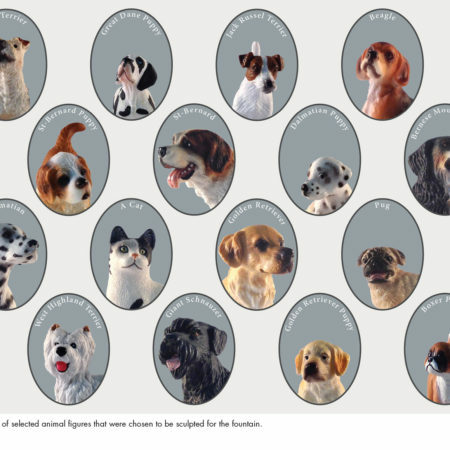 ), and comfortably relaxed attitudes that encourage people to give in and just let themselves feel good.